This breathable, cellulose insulated Passive House has been built for the Finland Housing Fair by Greenbuild Finland and features Clayworks clay plasters on many of the walls. Important to Greenbuild was good indoor air quality, and intrinsically low carbon, breathable and non-toxic products embedded into the fabric of a safe, dynamic structure. The more the fabric of the building can do to regulate temperature, humidity and clean air the less technology is required. Their vision was to create a modern home with a traditional architecture embracing Passive House standards. 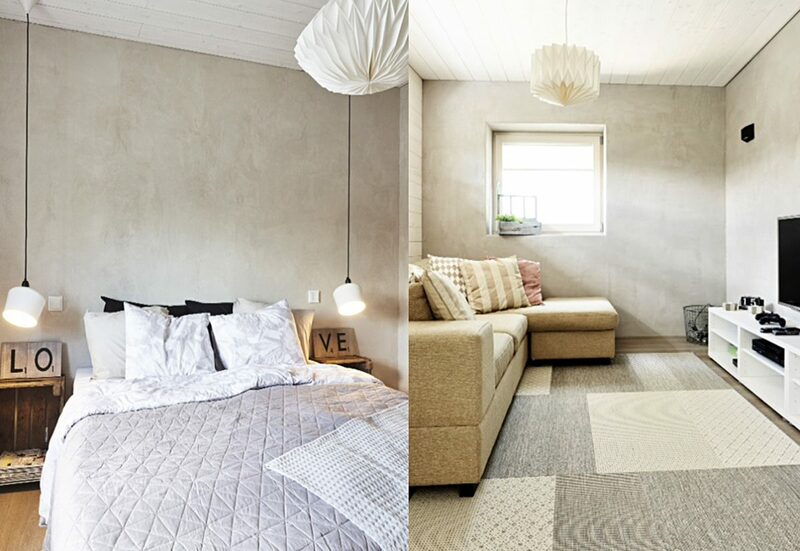 Our agent in Finland, Ville Vainamo explained that Clayworks plasters were selected not only for their performance benefits but because Greenbuild loved the look and tones of clay plaster. We asked Ville why he chose to represent Clayworks in Finland. ‘I chose to work with Clayworks because the plasters are pleasant to work with and they have a unique look, a unique feel’, he explained. ‘I especially like the tones with mica as they give something more to a space, a particularly special patina that I cannot explain. I have also heard this from our clients. ‘We heard about Clayworks through recommendation and word of mouth and have selected their plasters because they are reliable and have a particularly stable quality. We have preferred to work with your products more than any other due to the ease of use’. Finlands’ Housing Fair is set up in an area where actual houses are built and decorated for the audience to visit. The houses are built for families that are going to move in and live there after the Housing Fair closes and hence there is no waste of resources or effort. It is a real place and thriving exhibition of latest architectural and interior trends and products, where housing developers and builders as well as interior designers and furnishing manufacturers can introduce their work to a large audience of both professional and private fair goers. Greenbuild was founded in 2009 to make environmentally responsible, new generation prefabricated buildings. Green build specialises in energy and environmentally efficient wood construction. Their expertise is based on over than 20 years of experience in construction in Finland and Germany. Photos courtesy of Greenbuild Finland and Ville Vainamo.